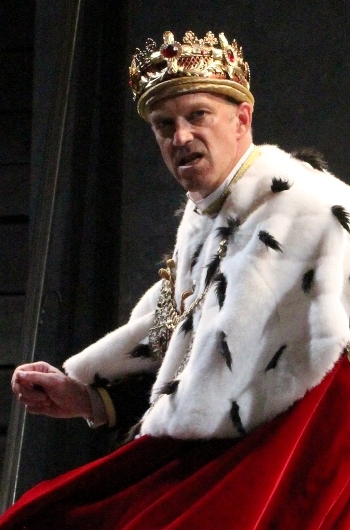 Interview: The veteran Shakespeare actor shares his insights — and fascination — as the ruthless usurper in “Richard III” with American Players Theater. The show runs through Sept. 28. 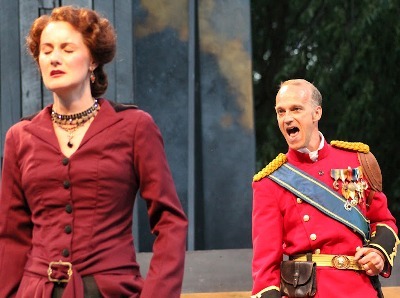 Ridge, a veteran of 15 summers with APT’s open-air, Shakespeare-oriented festival in Spring Green, WI, says the essential delight of playing the Bard’s self-proclaimed villain lies in the sheer audacity of his grab for the crown of England. “In the first scene Richard tells the audience, ‘Here’s what I’m up to’ – then he does it, right in front of everybody,” the actor says. “So the audience is sort of in it with him. But the other characters in the play don’t know what’s going on. They haven’t heard his monologues. 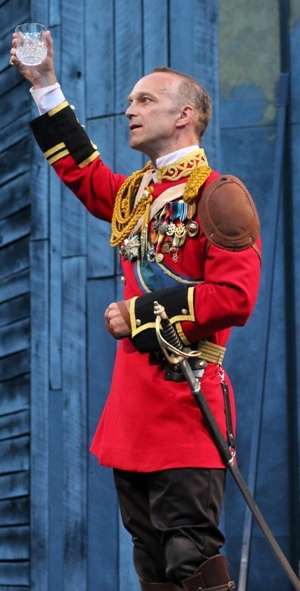 Richard, he says, is just being Richard, a wily and fierce soldier but also a man who, partly owing to his disfigurement from birth, feels alienated and utterly unsuited to courtly love. Isolated and bitter, he commits himself to villainy, on a maniacal quest for the crown. He will annihilate anyone who might stand between him and the prize. Richard’s most audacious gambit comes early, when he confronts Lady Anne Neville, the widow of Henry VI’s son Edward, with an urgent protestation of love. She is accompanying Henry VI’s body to his funeral. 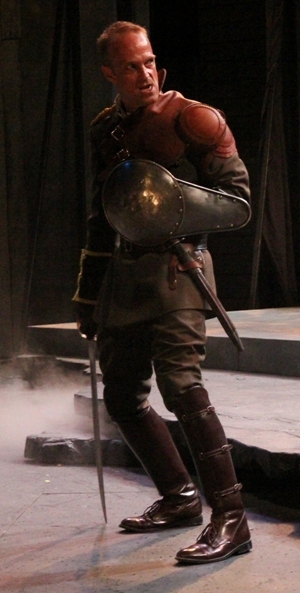 Richard has had a hand in the murder of both men, and Anne hurls his deeds in his face. Unfazed, he readily admits to both, but says by his own hand he has sent these men to eternal bliss and now offers in himself a better husband than the one she had. By the end of this amazing exchange, Anne has agreed to marry him. “When I was living with the play this winter, that scene was the most troubling to me,” says Ridge. “I couldn’t imagine how to play it out so that the audience would buy it. At the start Melissa Graves (who plays Anne) and I would talk about possible back stories – how Richard and Anne grew up together. James DeVita (the director) let us put those ideas into scenes for a couple of weeks of rehearsal, but we really couldn’t make it work. But Ridge observes that it’s quite a different Richard who makes a later, similar appeal to the widowed Queen Elizabeth (played by Ridge’s wife, Colleen Madden) for the hand of her daughter in marriage. By then, Richard has indeed gained the throne, yet his old swagger and cavalier spirit have given way to the uneasiness of a monarch steeped in blood. “His game is not the same,” says Ridge. “How it gets played out is so interesting. Elizabeth gets inside his head. Her righteous indignation keeps backing him down.” When oily rhetoric fails, Richard descends to threats to bring Elizabeth around. Ruse after deadly ruse succeeds for Richard. 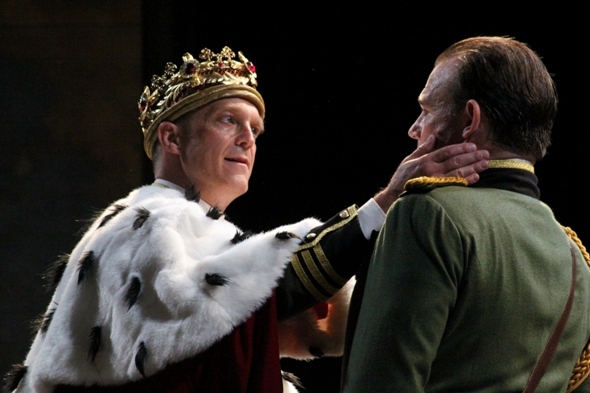 As he gets closer to seizing the crown, he turns back to the audience to confess his own amazement. Ridge elaborates: “Basically he says, ‘Can you believe this is working – and nobody’s stopping me.’ It’s like being in the secret room with the guys at Enron. He really believes nothing can stop him. Like Macbeth, Richard becomes so immersed in blood that there’s no turning back – even when his conscience is finally pricked in nightmares of the ghosts of his victims visiting him the night before his fateful battle at Bosworth Field. “He talks about his conscience and the reality of his actions in an emotionally wrenching moment,” says Ridge. “Richard has based his whole life on a particular set of assumptions – that there are no consequences for his actions and that the strongest survive. 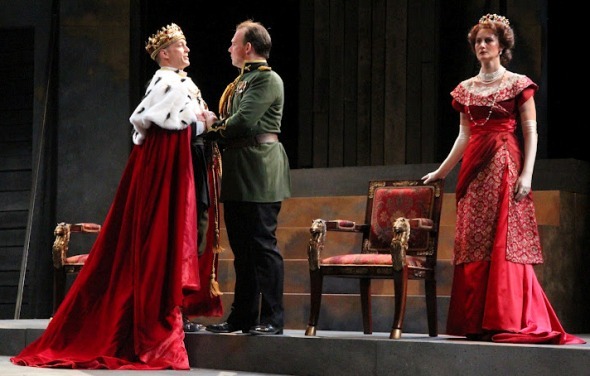 While scholars have labeled “Richard III” as a history play, Shakespeare titled it a tragedy. What makes it so, says Ridge, is “the potential of that brilliance, which becomes warped and cannot be redeemed even in the light of his awakened conscience. Rather he goes pell-mell into battle and to meet his death.